My previous blog featured New Zealand native plants that are cultivated overseas. However, some of our native plants, including many of the species I recently saw in UK gardens, have gone ‘rogue’ and are considered invasive species in some countries. For example our pohutukawa (New Zealand Christmas tree; Metrosideros excelsa) is invading parts of South Africa. In San Francisco pohutukawa trees were planted along streets in the 1980s. The roots of these trees are now destroying sewers and pavements. There are quite a few New Zealand native plants considered weeds in the Pacific. Karaka (Corynocarpus laevigatus) has naturalized on several islands in Hawaii. It is most common on Kauai, where aircraft spread its seeds in the 1920s as part of a re-forestation programme. It is thought to be a particular threat to heau (Exocarpus luteolus), one of Hawaii’s most endangered tree species. 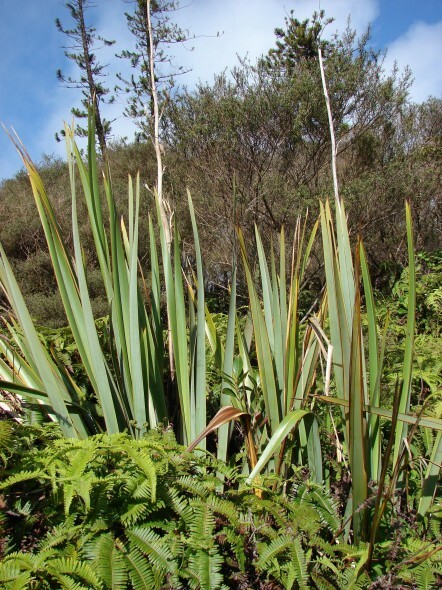 Perhaps the award for the worst plant weed of New Zealand origin goes to New Zealand flax (harakeke; Phormium tenax). Flax has become invasive on Molokai Island in Hawaii, where it has invaded high elevation rainforest. It is also invasive on the Juan Fernandez Islands (near Chile) and in Australia. 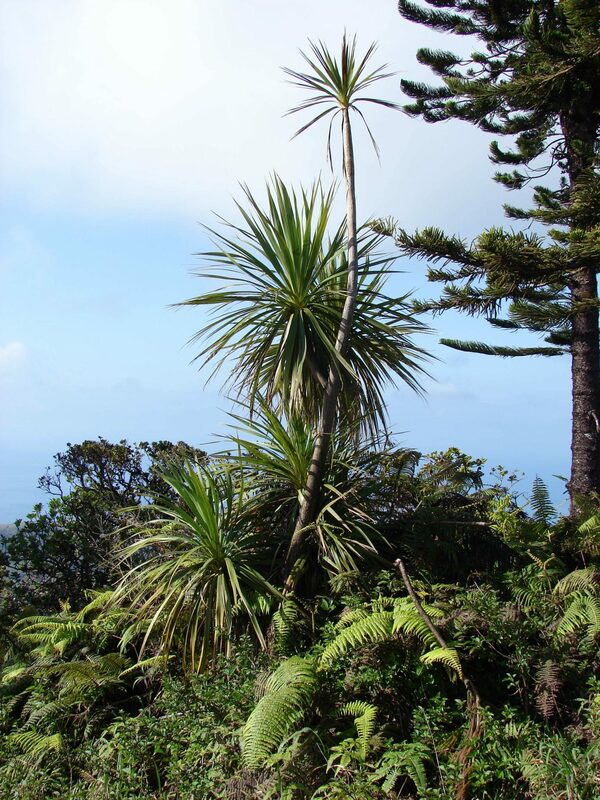 However, St Helena, a small island in the South Atlantic Ocean, is where New Zealand flax has the greatest impact. Flax was first brought to St Helena in the early 19th century and it was recorded as naturalizing by 1852. In 1907 a flax mill was established and large areas of native vegetation cleared for flax plantations. The production of flax fibre became the only staple industry on the island. The last flax mill closed in 1966 and flax is now threatening many of the endemic plant species on this remote island. You can find out more about flax on St Helena, including some amazing photos of this weed dominating the landscape on this blog. Akeake (hopbush, Dodonaea viscosa) is an interesting case. This species naturally occurs in a number of countries including Australia and New Zealand. A horticultural cultivar of akeake with purple foliage (Dodonaea viscosa ‘purpurea’), originally from Marlborough in New Zealand, is popular with gardeners in a number of countries. In Western Australia, where this cultivar was widely (but incorrectly) sold in garden centres as native to Australia, it has escaped and is invading areas of native bush. New Zealand pygmyweed (Crassula helmsii) is an aquatic succulent, naturally occurring on the West Coast of the South Island, where it is uncommon. However, it has been introduced around the world as an oxygenating plant for ponds and aquariums and has naturalised in the United Kingdom, western Europe and southeastern United States. It can regenerate from small pieces, which are easily spread e.g. by birds, boats or fishing gear, forming dense mats that outcompete native aquatic plants, invertebrates and frogs. Earlier this year New Zealand pygmyweed was included as one of five aquatic plants that will now be banned from sale in the United Kingdom. This is the first time that the sale of non-native plants has been banned in the UK. Other New Zealand natives and the region(s) they are invading include: Taupata or mirror plant (Coprosma repens) in several Australian states, ngaio (Myoporum laetum) in California, wire vine (Muehlenbeckia complexa) in Western Australia and California and cabbage trees (Cordyline australis) in several Australian and US states. For more information on New Zealand origin weeds see this website. However, none of our New Zealand plants are as serious invaders as some of our native invertebrates. For example, the New Zealand mudsnail (Potamopyrgus antipodarum) is a small freshwater snail that has invaded numerous European countries as well as Australia, Japan, USA and Canada. This species has no natural predators and can reproduce at a phenomenal rate – within seven years of invading Lake Zurich in Switzerland it had reached densities of 800 000 snails per square metre! Toetoe (Austroderia richardii) in Tasmania; mangrove (Avicennia marina subsp. australasica) in Mission Bay, San Diego; New Zealand sedges (Carex albula, C. buchananii, C. flagellifera, and C. testacea) in Tasmania; karamū (Coprosma robusta) in southern Victoria and Tasmania; soldier’s button (Cotula australis) in USA and Hawaii, bachelor’s button (C. coronopifolia) everywhere; Mercury Bay weed (Dichondra repens) in California; creeping willow-herbs (Epilobium brunnescens and E. nummulariifolium) in Britain; hairy pennywort (Hydrocotyle moschata) in California; mānuka (Leptospermum scoparium) in Hawaii; karo (Pittosporum crassifolium) in Australia, Norfolk Island, Hawaii, the Isles of Scilly, and California; lemonwood (Pittosporum eugenioides) in Australia and the Juan Fernández Islands; kōhūhū (Pittosporum tenuifolium) in Australia, California and the Juan Fernández Islands; pōroporo (Solanum aviculare and S. laciniatum) in China, eastern Europe, and Russia; and New Zealand spinach (Tetragonia tetragonioides) in many parts of the world. These are the weedy distributions although some of the NZ natives are also indigenous to other countries so may not have spread from this country. The article I mentioned working on has now been published in The New Zealand Garden Journal, Vol. 17, No. 1, June 2014 (p.10-24). Eventually this will also go online at http://www.rnzih.org.nz/pages/NZ_Garden_Journal_index.htm. Thanks Lara for blogging about Crassula helmsii which was a new example to me. 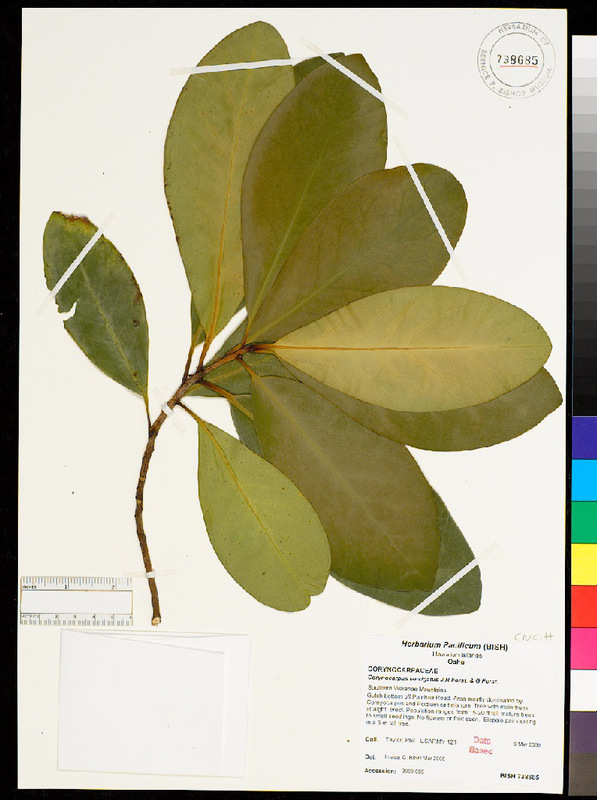 Also thanks Leon Perrie, also of Te Papa, for permission to print your excellent Coprosma repens images in my article. Wanganui botanist Colin Ogle has drawn my attention to another New Zealand plant causing trouble overseas – bidibid (Acaena novae-zelandiae), which is a serious weed in the UK. Colin has written an article about this weed for the Wanganui Chronicle (http://www.nzherald.co.nz/wanganui-chronicle/opinion/news/article.cfm?c_id=1503423&objectid=11133036). Despite considerable efforts (including hand-weeding and spraying with herbicides) it appears that it will be impossible to eradicate in the UK.